Daily Illuminator: Celebrate Chinese New Year With GURPS! January 31, 2014: Celebrate Chinese New Year With GURPS! • GURPS Martial Arts describes 10 Chinese styles, from the meditative T'ai Chi Chuan to the pragmatic modern Wushu. 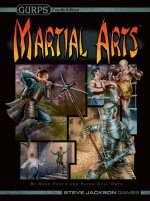 Detailed game mechanics let you play out all the tactical nuances of armed or unarmed combat. For a wilder campaign, use cinematic skills and techniques to emulate the special effects of martial arts films and the legendary feats of ancient xia (Chinese heroic adventurers). 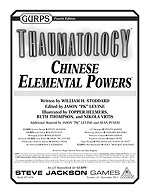 • GURPS Thaumatology: Chinese Elemental Powers adds the arcane powers attributed to advanced martial artists or legendary wu (Chinese sorcerers). Inspired by the Taoist cycle of five natural elements, this system of "magic as powers" offers a variety of ways to attack, defend, influence the natural world or the human body, or neutralize other elemental powers. Elemental abilities can augment cinematic martial arts skills -- or the peaceful cinematic arts of Alchemy, Esoteric Medicine, Fortune-Telling, and others. A customized version of the rules from GURPS Powers shows exactly how to apply the powers of wood and water in game play. • And finally, GURPS Classic: China offers an overview of a lot of what makes the Empire of the Dragon so awesome for gaming. For a campaign set in ancient, historical, or present-day China, or for Chinese magic in any setting, you provide the imagination; GURPS provides the rules!